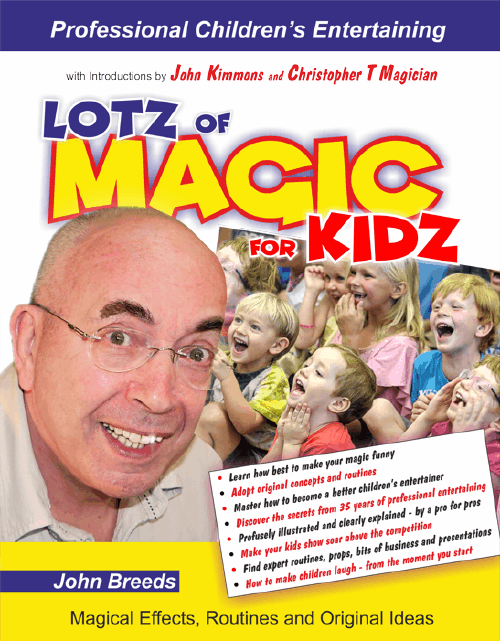 John Breeds Magic - Lotz Of Magic For Kidz! John Breeds’ previous book, the best-selling, How To Create Kids’ Magic is still acknowledged as the best book of its kind. David Kaye described this publication as “...the A to Z of all aspects of being a professional children’s entertainer”. It embraced the business of earning a good living as a children’s magical entertainer. Now, continuing in a similar style, John Breeds treats you to dozens of routines from his working repertoire. His full explanations, attention to the smallest detail and his crystal clear illustrations show you how someone with 35 years performing experience brings his material to life. Remember, John Breeds is the proven creator who brought the world’s magicians: Visible Magic Painting, Wacky Washing Machine, Pro-Epic, the funny Lie-Detector and hands-free electronic gizmos. This new book for professional entertainers brims with creative, funny and mystifying magic that will rejuvenate your shows with fresh material. Available direct from the author, John Breeds.